I’m going to go with Become the Expert. You know the self-help section is filled with lots of books on how to be this and that but the three books I’m going to recommend while they aren’t the typical self-help, I think can help you find yourself. At least they certainly gave me a lot to think about! The Art of Happiness by the Dalai Lama. A book that focuses on pursuing happiness even during trying times. I read this one shortly after my dad passed away. I felt so lost and this book reminded me that we are all going through difficult times but it is how we face them that we can move forward. Happiness doesn’t come just from external events but from within and to achieve happiness you must first practice compassion. The Battersea Park Road to Enlightenment by Isabel Losada. “I want to find out how to live life completely, abundantly, joyfully, stupidly.” The author goes on quest trying out different seminars, retreats and paths to achieve enlightenment. It was funny and didn’t necessarily give you the one thing that is going to bring you Enlightenment but just shows the sometimes crazy or odd things people will do all in the pursuit of happiness. More importantly, I think it gives you comfort in knowing you aren’t alone in the journey. Tales of a Female Nomad by Rita Golden Gelman. When her marriage fell apart, the author travels to a village in Mexico to find peace and herself. What she found was the desire to connect with others and reinvent herself and she began the life of a nomad traveling around various countries always immersing herself in the culture and forming ties with her host’s community. I cannot imagine not having a base but I wouldn’t mind more travel in my life. Have you read any of these? Would love to hear what you thought. The Art of Happiness may be a book I should pick up at my library tomorrow. With my dad’s recent diagnosis and hospitalization, I am fully prepared to say goodbye in the coming weeks. I know my heart will be broken, but I know (from previous experience) that I will survive this heartbreak. A gentle reminder from the Dalai Lama couldn’t hurt, though. Thank you for the recommendations, Iliana. I haven’t read any of those but they look so interesting. 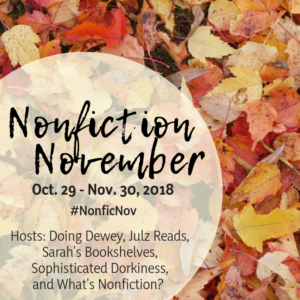 I’ve always meant to do NF November but then forget to make the list. Hope you are having a good week. Les in OR – I could see you guys touring all over the U.S. And, I’m so sorry your dad has been going through such a difficult time. My prayers go out to him and your family. It is the worst to see our loved ones so ill and really there are just no words. Sending you a big hug! Diane – Well, I don’t know that I’ll actually finish a single book for NF November but I’ll try. If anything at least I’m collecting a lot of titles I want to check out! Ha. Have a great week! Lark – It is awesome isn’t it? I probably should do another re-read of it. Oh, the Losada book sounds a lot like STALKING GOD by Anjali Kumar, which I read earlier this year. A woman goes on a journey trying all of the ways people have found faith/god/enlightenment — some of which are a little more esoteric than others. But she breaks down why it is we might think that. All three of these sound like really interesting titles – made note of them. Books surrounding this topic are some I quite enjoy. Thanks for sharing! I haven’t read any of those but they do sound good. I like the self-help genre. Nice recommendations 🙂 I haven’t read any of these but they sound good, especially the Dalai Lama one. Happiness does come from within. Enjoy your week!